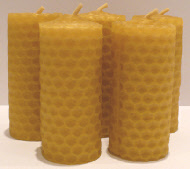 These candles are hand rolled from sheets of wax foundation that we use in our own beehives, it makes fantastic candles that have a brilliant aroma. These candles are clean burning, smell fantastic and of course, they're completely renewable. Burn time is approximately 3 hours.